Are you looking for a custom embroidered hat? Want to see your logo stitched expertly onto a bag, polo shirt or jacket? We put our stitching skills up against anyone in the business. And we're not being cocky, we're simply experts in our field who have some of the most precise large-scale embroidery machines on the market. GraphicLab Promotional Products in San Diego can match your output needs whether you're launching a clothing line, need staff uniforms, or just want "swag" for an upcoming event. Our standard custom embroidery service includes a lot of stuff "the other guys" say they do, but don't. Schedule a visit to our San Diego warehouse so we can prove it! 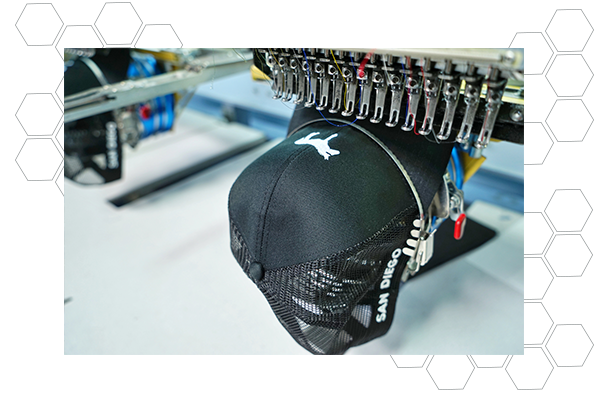 GraphicLab Promotional Products uses only the best high-quality rayon thread for our custom embroidery work. Rayon not only provides strength and longevity but non-fading, vibrant colors. There's a virtual rainbow of colors we have in stock, and can special order your specific color. Do you only have a .jpeg of your logo? No problem. Are you interested in a custom embroidery design? Check and check! Our digitizers will create an embroidery file (.DST) in under 24 hours. These files are then fed to our state-of-the-art Barudan commercial embroidery machines that will stitch your artwork with precision and unparalleled speed. At full capacity, we can output high-quality, detailed garments at a pace of 300 pieces a day. Don't let that scare you off, because we specialize in low quantities as well! Our team of professional operators (each with at least 15 years of experience) will make sure your job is done right the first time. For our local customers, we invite you in to watch your business embroidery project stitch by stitch. Seriously, we love when our clients come say hi and watch us do our thing! You get a large factory feel and finish, but with that small shop attention you deserve. Your apparel never looked so good.